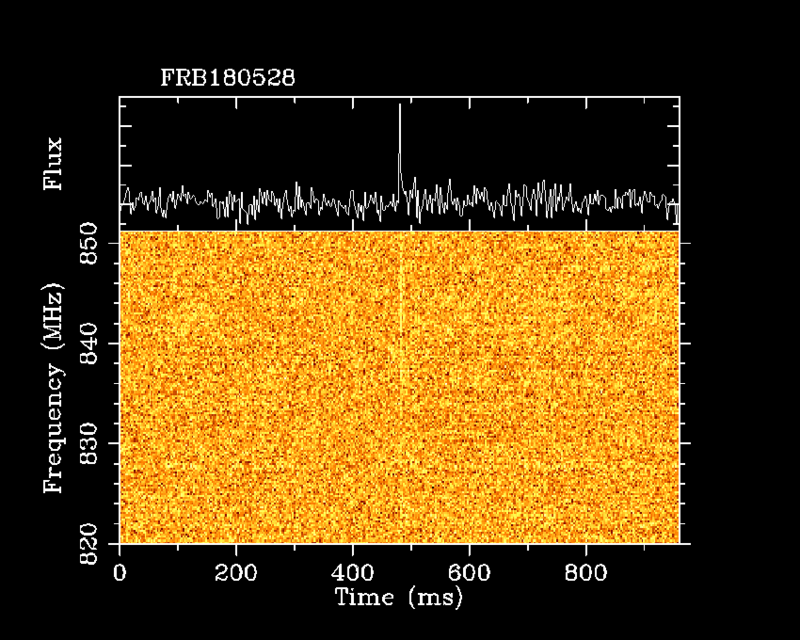 On 2018-05-28-04:24:00.9 UTC (2018-05-28.18334375), UTMOST found a new FRB (FRB180528) as part of the ongoing search program at the Molonglo Radio Telescope (see Bailes et al. 2017, arxiv.org/abs/1708.09619). This is the sixth Molonglo FRB overall (See Atel #10867, ATel #10697 and Caleb et al. 2017, MNRAS, 468, 3746). The FRB was discovered in real time, and voltage capture was successfully triggered (see Farah et al 2018, https://arxiv.org/abs/1803.05697). The dispersion measure (DM) of the FRB is: 899 pc cm^-3, which is substantially in excess of the Galactic DM as estimated by the NE2001 (www.nrl.navy.mil/rsd/RORF/ne2001/) model (~69 pc cm^-3). The upper limit on the DM-inferred redshift z is thus z~0.7. The S/N in the detection beam is 14, and a preliminary estimate of the event’s fluence is ~ 18 +/- 4 Jyms. This is a lower limit as the event’s position is poorly constrained in the North-South direction within the primary beam. The FRB’s estimated width (full width half power) is 1.3 ms.
Where RA is in hours, DEC is in deg, and is valid in the DEC range [-54,-46]. 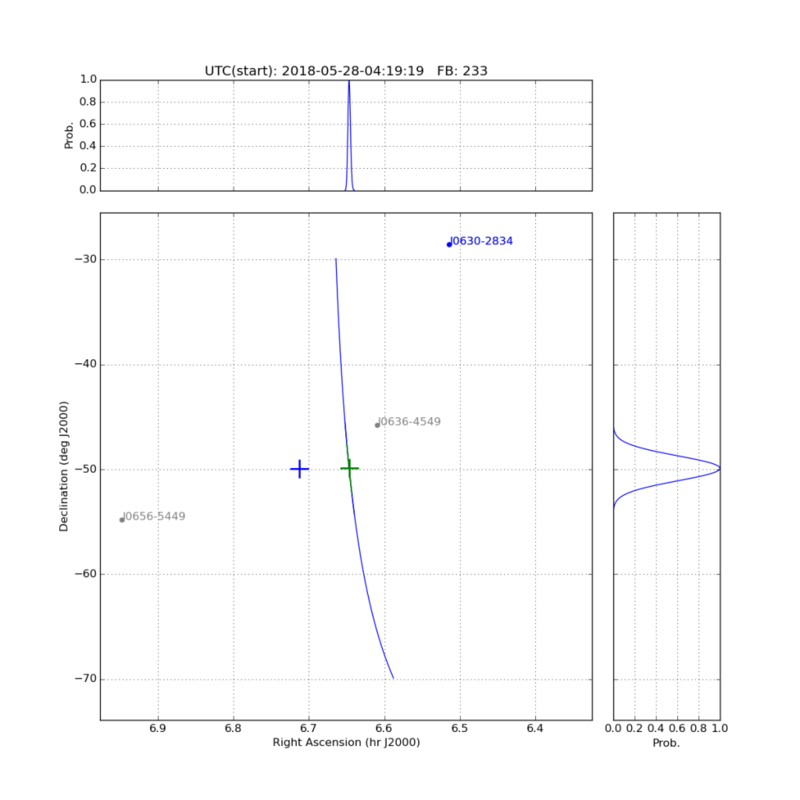 Localisation plot for FRB180528, with the center of the localisation arc marked by the green square. The telescope boresight position is marked by the blue square. The positions of 3 pulsars are also marked.